Shanghai Girls is a short and easy book to read, yet is is so beautiful, cultural, and deeply human. 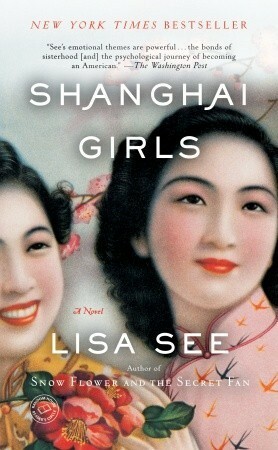 It tells the story of Pearl and May, sisters in 1937 Shanghai (also known as the Paris of Asia). They are young, beautiful, privileged, work as models, and are engaged to wealthy business heirs. In short, their lives are perfect. This abruptly ends with their father's financial demise and the outbreak of WWII. Their homes and lives are completely destroyed. They endure the worst sorts of heartbreak as they make a dangerous escape to America and try to find their fiancees. Once in California, they are held on Angel Island for months where they wan and are on the brink of starvation and mental breakdowns. When they are finally released, they make their way into their new lives. The rest of the book follows them for the next 25 years. We meet their fiancees and new families, learn about their adjustments to living in America (in a time with much prejudice towards Asians) and watch as they face their new identity struggles. I loved the sisters' relationship. Even though they were complete opposites and often did not get along, they were very devoted and protective of each other. Well into their 40s and 50s they wouldn't leave each other's sides. They clung to each other because they were all they had left of China, their parents, and their old lives. Pearl and May perfectly complimented each other and it was great to read about the different paths they took in their new lives in America. I can't wait to read Lisa See's other book, The Snow Flower & the Secret Fan, if I know it'll be half as good as this one! I also discovered that a sequel to this book recently came out, focusing on Pearl's daughter, Joy. I'll have to pick it up soon! It sounds wonderful!! And definitely something I should be reading :) Hope you enjoy both the sequel and Snow Flower and the Secret Fan! I loved this book and the artwork on the cover. I looked up pictures of calendar girls from Shanghai and they looked just like that. I haven't read Snow Flower and the Secret Fan, but plan to. I like the sound of this novel, especially that it focuses on the relationship between the sisters. I didnt grow up with any sisters but I now have a step sister, which feels like completely new territory. So as a result I've found myself drawn to books about sisters. Adding this one to the list. I recently read the sequel and it's great too! So far I have loved everything written by Lisa See. I can't wait for more! The cover is beautiful, definitely one that would draw me in right away. I really enjoy novels that focus on family relationships, especially siblings. It's interesting that they never leave each other. Definitely one I'm interested in. I was not fond of this book..and hated the ending. Oh well. I didn't like this book, or the sequel, which is a shame since I love everything else Lisa See has written. I'm glad you enjoyed! Snow Flower was awesome :) Glad you liked this, too. I really enjoyed this book but Snow Flower is one of my all-time favorites. Don't miss it -- but don't see the movie - it's awful! I'm mostly a YA reader/reviewer, so I've never really picked this one up, although I really should - especially since I feel this book could make me so much closer to my culture. Nevertheless, I love your review! I especially liked how you described the sisters' relationship - it mirrors my sisters' and I even though we're both still in school and more "modern" as you can say it. Thanks for the review!